The syrup is also delicious drizzled over ice cream or a warm cake. For the granola, preheat the oven to 180 ̊C, gas mark 4. In a bowl, mix the nuts, oil, oats and 21⁄2 tbsp honey. Spread in an even layer on a baking sheet lined with baking parchment; cook for 15 minutes, stirring halfway though. Cool, then break into pieces. For the syrup, use a lemon squeezer to juice 11⁄2 pomegranates. Strain into a pan with the remaining 2 tbsp honey. Boil for 2 minutes, then add the lemon juice. Cool, then stir in the seeds from the remaining 1⁄2 pomegranate. 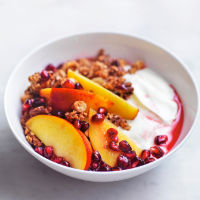 Divide the yogurt between 4 bowls; top with the fruit, granola and syrup.